Green Leaf Sushi, located in Kitsilano, is a place that I had never heard about until it showed up in Zomato's Super Sushi collection. 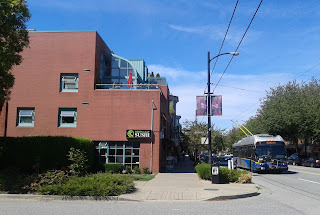 Without knowing what to have for breakfast, I decided to satisfy my curiosity by heading over to Green Leaf Sushi. Since the restaurant is relatively new with prices slightly on the higher side, I was expecting classy, modern decor. It looked quite promising on the outside, and all the staff greeted me (in Japanese style) as I walked in. I looked up and saw a few large paper fish as well as the Aburi Menu (seared sushi) on the chalkboard. I did not remember seeing any Aburi sushi in any of the online reviews or photos I had browsed through, so I figured that the Aburi gods were smiling at me. Furthermore, how could I resist the "spicy, fresh appetizing toppings"? 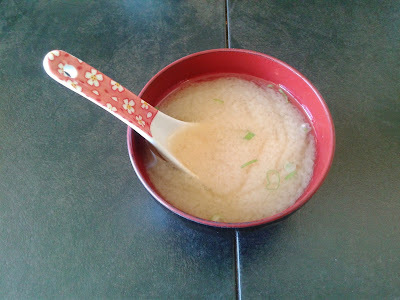 The Miso Soup was standard fare. Garnished with seaweed, tofu, and green onion, it was mild in flavour and not too salty. The rest of my order was beautifully arranged on a wooden board. I could smell the captivating aroma of torched sushi as they were preparing the Aburi Salmon Oshi Sushi. 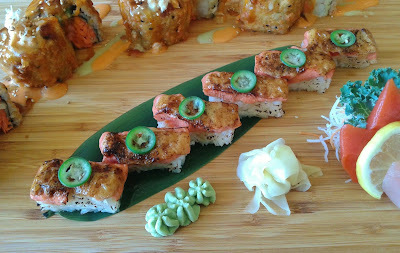 After snapping a few pictures, I dove right in to try the Aburi Salmon Oshi Sushi. 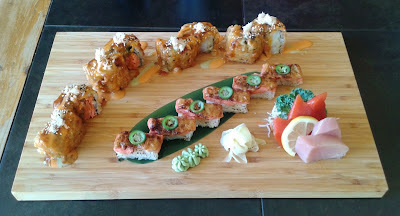 Oh my... the Aburi Salmon Oshi Sushi ($12) completely blew my expectations. The toppings were truly fresh, spicy, and appetizing. The amount of sockeye salmon was generous, and the serrano pepper accentuated the flavour of the seared oshi sauce perfectly. It was slightly spicier and richer than Miku's version, and I was able to relive that heavenly melt-in-my-mouth texture that makes Aburi Salmon Oshi Sushi so delicious. I ate all six of the pieces before I even thought about trying any of the other items. The Appetizer Sashimi came with three pieces of Sockeye Salmon Sashimi and two pieces of Tuna Sashimi. The menu stated four pieces in total, so they were being generous. Both kinds of sashimi were fresh. 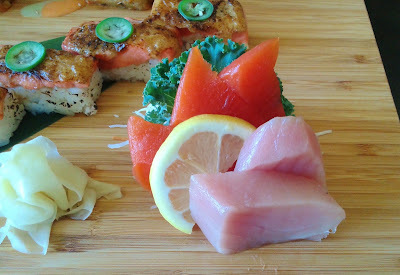 The Sockeye Salmon Sashimi had a nice smooth texture, while the Tuna Sashimi was delectably soft and melty. The OMG Roll was a real filler. It came with eight enormous pieces consisting of avocado, crab meat, cucumber, salmon tempura, prawn tempura, a deep-fried exterior, and tobiko along with unagi sauce, peanut sauce, and wasabi sauce. I especially enjoyed the slightly crisp exterior and the rich prawn tempura inside. Indeed, the wasabi sauce provided a moderate amount of spiciness to the roll. I never noticed the sprinkles of crab meat on top until I was down to the last two pieces (they sort of got lost in the richer flavours of the roll itself). 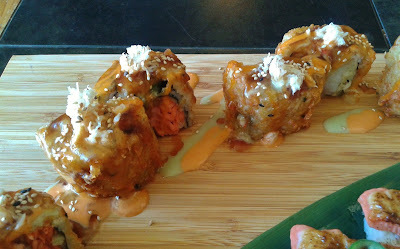 This is a roll that is best if shared between at least three people, because OMG, I was so full at the end. The Korean staff were quite friendly during my visit. Aside from the ambience, this breakfast completely exceeded my expectations (pardon me for eating breakfast at noon). The food was carefully prepared, and there was a healthy stream of customers during the course of my visit. I really hope that the Aburi Menu is permanent because now, I know where to get good Aburi Salmon Oshi Sushi if I do not feel like having a lavish, expensive meal at Miku. Interesting! 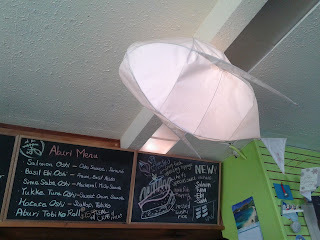 I visit Green Leaf Sushi fairly regularly, but never noticed the aburi menu before. I'll have to visit again soon! I'm pretty sure their Aburi Menu is a new thing. They also have an Aburi sampler where you can try several different kinds at once!